“Otaku” is a Japanese word that generally refers to anyone who is geekily obsessed with something. Initially the word referred to young men obsessed with manga and anime but the word has now come to be used for just about any kind of obsession and I’d say us crazy knitters can easily fall under this umbrella. And seeing as Noro yarn is from Japan then I say all the more reason to be a Noro Otaku! 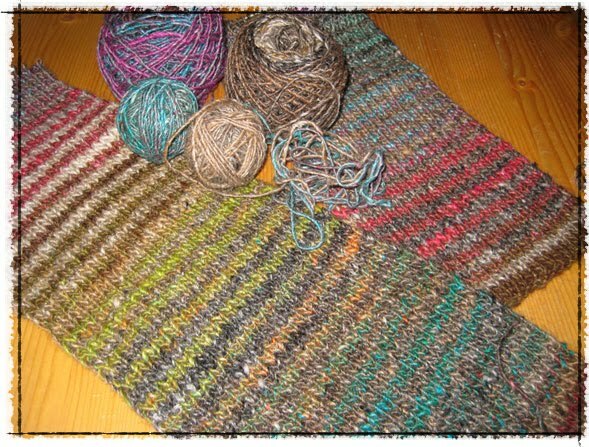 The thing about these Noro striped scarves is that once you start it is incredibly difficult to put the project down because you can’t wait to see what the next color combo will end up being. I chose a skein of very neutral greys and browns and combined it with a skein of bright colors. But unexpectedly the brights occasionally become neutral when transitioning so the stripes aren’t always well defined but I’m really liking the subtle shifting here. Way behind on my blogging… So here’s some catch-up from a xmas gift I made for my friend Janel who moved into a new home last year and needs all the cozy stuff that makes a home a home. I’ve hardly done any crochet before and this is the first actual finished project I’ve completed with crochet. It’s all been little swatches here and there but this was a super simple project and definitely gave me the bug to do some more. 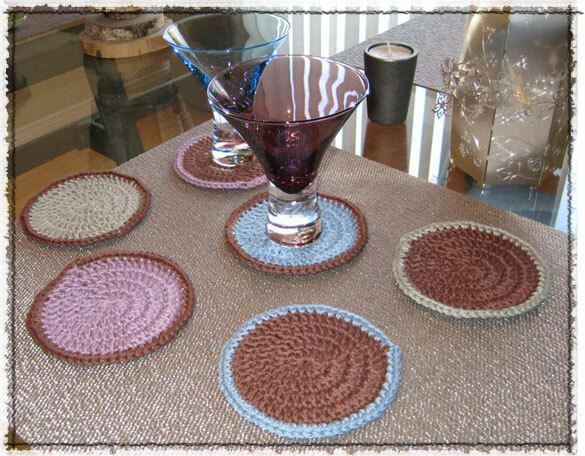 I didn’t follow any specific pattern though I used this video on YouTube to get started and roughly followed this Summertime Coaster pattern that I initially found on Ravelry. I had a lot of fun picking out the colors at my LYS. It’s all Rowan Handknit Cotton which I think worked out perfect for this kind of project and comes in a bajillion colors. These were fast and fun and make a perfect gift if I do say so myself!